This laid back, smoke-free bar is popular among 30-somethings, with drink specials, a knowledgeable staff, and a jukebox. Last night Saturday, went after went to another scary bar in the area. Thus place ROCKS!! Great people, funny and very lively! The Only Review You Will Need! Ahh stirrup! This is a nice little bar, friendly staff and customers, more for the 25+ crowd i would say. 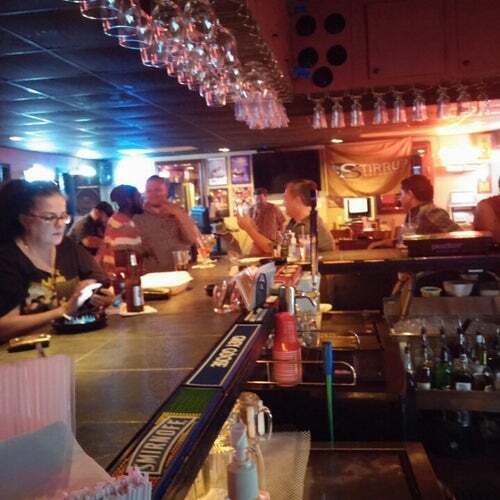 As for the bar, its a small place, has a couple different areas, with darts and pool table. Generally has the jukebox for entertainment. which can be nice, that way if you don't like what you hear you can invest in something better. As I said before the staff is very nice, and know how to do their job. The drinks are fair priced, and decent pours. (Well around $5 top shelf about $8-10). They accept cash and credit cards. They also offer a small food menu with appetizers and small bites. several TV's and I am told a good place to go for sports events. Parking is a challenge here, at least if you want to be close. There is about 12 spots adjacent to the building, and some off street parking. The owner also said they recently purchased a lot about 1/2 block away that has security on the weekends. The only CON that I can think of is that the bar does not have a clearly marked service area, making it difficult to get a drink when it is busy. But if you squeeze in between the bears they tend to like it, and may even buy your drink. :) This place does allow smoking, which is not my idea of good, but the smoke is not too bad, they seem to have decent ventillation. All in all, if your of the older crowd I think you will like this place. Best time I had in a long time when we had Jimmy Smiths getting out of Nashville get together.. What a great time there! This bar tends to get crowded..and I mean really really crowded, and when it does, I am not comfortable particularly. However, the staff is friendly, the crowd is not usually hostile, and it is a generally nice place to get a drink. They have special "group nights" when groups can provide food and/or beer and make it a group outing. That is a nice community touch. I also like the patio, and have found myself engaging in conversation with people that it surprised me to be able to converse with, being somewhat shy around new people. Certainly a place to try more than once. When you first go to a new town, you make the rounds bouncing from place to place having a drink or 2 until you find THAT bar. You know the one where the bartender has a big smile, the drinks are served quickly and cold, the place is clean, the customers don't glare at the new guy but rather engage in conversation, where the men are handsome and not pretty, and where you go back to first when you come back to town? Hands down THAT bar is Stirrup in Nashville. I just moved to Nashville and when I first walked into Stirrup...That's when I knew I was home. I liked this place! Filled with 35+ folks that are just out for a good time, you won't find attitude here. Back patio that is nice, if a bit narrow. Head to the BBQ area for a bit of touchy-feely, if you care to. This one is a must for the older/cruiser crowd! Fast service and STRONG drinks, too! We will return to this bar! What makes a bar great for out of towners, is to be clean, friendly (both bartenders as well as customers) and this bar certainly fits that aspect of it. LOVED this bar. All around great place. Good food, music, fun, friendly. Nice patio. All ages but generally 30's up. Jimbo and Mikey make you feel welcome and are easy on the eyes!